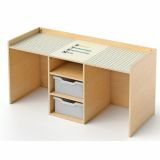 A real STEM activity desk for Early Learners! Our innovative desk has two bays to accommodate two students, a three-shelf center console that includes two Gratnell trays, a high quality non-ghosting markerboard surface, and a lip around the top perimeter to keep everything organized. Constructed in beautiful, durable birch laminate in safe, non-toxic natural UV finish that won't yellow and withstands rigorous use by children. A complete preschool STEM furniture ensemble and 2017 IIDA EDspaces Innovation Award nominee! Our innovative desk has two bays to accommodate two students, a three-shelf center console that includes two Gratnell trays, a high quality non-ghosting markerboard surface, and a lip around the top perimeter to keep everything organized. Includes two of our ingenious Rolling Seat and Storage Bins whose cushioned seat lifts off to reveal roomy compartments that store manipulatives, toys, supplies or other classroom materials and feature write and wipe boards for messages, drawings, or classroom work. Constructed in beautiful, durable birch plywood in safe, non-toxic natural UV finish that won't yellow and withstands rigorous use by children.